3/4/17 Augie is ​an​ 11 ​week​ old 16​ ​lb. Aussie/Golden Mix. He is mainly white with some tan spots and a lovely little tail. He has a little vision and can hear. Augie is a happy active pup who loves walks and outside play. He walks well on a leash and is making progress on housebreaking. Augie sleeps well in the Expen and no complaining. He loves to be held and loves to play with toys. Augie is up to date on​ vacciness and is maintained on Sentinel for Heartworm and Flea preventative. Augie does have some herding instinct ​and he does nip on legs a little​,​ so a ​family with older children would be best Augie. Since Augie is very active and loves to run​,​ a fenced in yard for his health and safety would be required. Augie was adopted on January 13, 2018. Healthy and happy. Has hearing and some vision. Augie is looking for his forever home. If you think it could be yours, read more about Adopting from BDRA before submitting your application below. BDRA relies on your donations to rescue blind dogs around the United States. Please consider giving in support of Augie. Augie is 9 month old. He continues to do well in his foster home and loves outside play the most. He loves to chase Balls and Discs and can retrieve them. His sense of smell is so good that he knows exactly which ball we throw. Augie is housetrained and never has accidents. When we are away from home Augie is in a big expen or behind tall baby gates and sleeps in an expen with no complaints. He loves walks but Augie will still pull on the leash some when excited and when the neighborhood children rush to see him. They just love Augie and it is great for him to work on his social skills. Augie loves everybody he meets. Augie is still too interested in cats to be adopted to a home with cats. 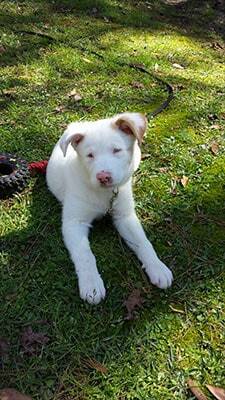 Augie has alot of energy and loves to run free and play. We would love for Augie to have a fenced in yard so he can enjoy to run free and play. We would prefer not to have Augie left unattended in a yard we just want him to be able to play free and be safe. Augie continues to do well in his foster home. He is now 7 months and growing at 47 pounds. Augie is Neutered and up to date on all medical and takes Sentinel monthly for Heart worm and Flea Preventative. Augie loves to be cuddled and he loves his toys but his happy place is in his pool. He loves to run and play outside and Augie can retrieve balls and discs. Augie loves walks but will pull on the leash when meeting people on his walks. We continue to work on this. He loves other dogs but as any puppy Augie’s energy can be overwhelming to some dogs. He is still very curious of cats so a cat free home would be best for Augie. Augie sleeps in an expen at night and when his family is away from home. Augie sleeps all night with no complaining. He is very energectic and loves outside play and walks. A fenced in yard for Augie is required as he loves to run and play and for his happiness and safety a fence would be great! We feel that Augie would do great with a very active family with older children. 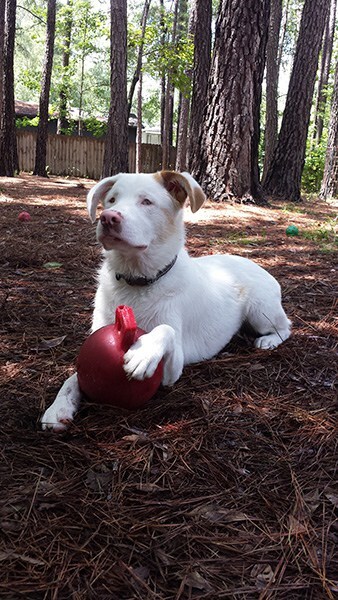 Augie can hear but is Visually impaired and he does not let it hinder his enjoyment in life. Augie is a very sweet and bright pup . Augie continues to make progress and loves life . He loves walks and outside play. Augie loves his pool time. He is doing so much better with nipping and mouthing since he is getting his big boy teeth . Augie loves snacks and his favorites are peas and carrots. He is 95 percent housebroken. We are working on Augie pulling on the leash when excited and meeting others. Augie is doing great and loving life and making new strides everyday in his foster home. With housebreaking he only has maybe 2/3 accidents a week. He is doing well on the leash with a little pulling on the leash some when he meets new people on his walks but always happy to meet new people. He has shown that he is very interested in cats so a Cat free home would be best for Augie. Augie has lots of Aussie energy and drive so alot of outside time with his owner is needed. He loves walks and outside play with others. Augie loves the baby pool. He does calm down but needs alot of stimulation before doing so. Augie needs a somewhat tall fence for free play to keep him safe. He also would do better in a home with older children. Augie does not do well in a crate for any great periods of time. Augie does sleep all night in expen with no complaints. Augie’s expen is a larger modified expen to suit his needs. Augie would love an active family with older children with no cats and not to spend his time in a crate when owners are away from home.